An interview with Marlena of Marlena Jarjoura Jewelry. I'm Marlena Jarjoura, a half Lebanese woman raised in Mississippi. I currently live outside of Austin, Texas, in a little off-grid cabin in the woods. When did you start creating jewelry? I’ve always been an artist, experimenting with drawing, painting, crochet, music, sculpture, any medium I could find. I started making jewelry a few years ago. I had recently moved to Austin and was at a garage sale and a big box of beads caught my eye. A little voice, as clear as rain, popped into my head and said “You’re going to be a jeweler.” I bought the box of beads, shoved them under my couch, and didn't think about them again. Then in 2014, I saw a wire wrapped necklace. I immediately fell in love. Tell me about your process? What materials do you like to use? Any significance? I’ve been digging crystals with my family since I was a kid so I’ve always had a large collection. When I saw the way that the wire was wrapped to hold the stones, I realized that this was my entry into jewelry making and into making my crystals wear-able. I use sterling silver and copper wire in combination with crystals or other stones to make the pieces. A pendant, earring, or ring all start out the same, with a stone and coiled wire, representations of raw nature. The two come together to create a symbol, a shield, a relic of the synergy that exists between us and our environment. 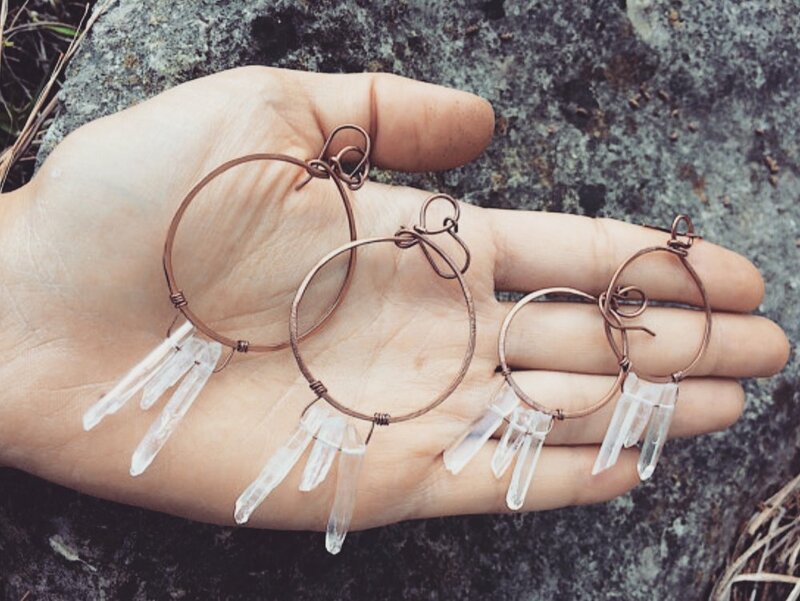 My most popular designs are actually my simplest: my crystal hoop earrings and necklaces. If you could collab with anyone on a collection, who would it be? I recently discovered the work of ITAYA, a couple of artists from Peru that make amazing handmade wire jewelry. I think a collaboration with them would be wonderful! I see you like to play guitar and sing as well. Who are your favorite musical muses? My favorite musical artist when I was a little girl was Jewel. As I've become an adult, I really connect with the heartfelt lyrics and awesome guitar playing of Ani DiFranco. What are your future goals for your collection? As far as the future goes, I would love to continue spreading my creativity in the form of music and jewelry to as many folks as possible. I feel so blessed to be able to live in the middle of Nature, surrounded by nothing but her vast beauty. I feel that my jewelry is medicine for those that need it, a small, but powerful reminder that we shape our earth and our lives, so it is wise to be in harmony and integrity while doing both. Marlena Jarjoura jewelry is available on Etsy. You can also hear her music and read about her off-grid life at marlenajarjoura.com. An interview with Marlena of Marlena Jarjoura Jewelry. Marlena combines crystals with wire wraps to create gorgeous earrings, rings, bracelets, and necklaces. Living in a little off-the-grid cabin, she is inspired everyday by the nature that surrounds her. Coachella is around the corner, time to start planning for the bohemian festival style of the desert with clothes from two of my favorites, Planet Blue and Free People.